Co-incidental this morning I got an email from Tobias Deml, a fellow in Austria [thought I fixed this earlier!] researching the "Third Wave", and I was able to point him to the article about Ron Jones in Volume 12 No. 6. Of course there's a lot of interesting stuff about the "firing" or "resignation" of Jones in the 68/69 school year which also had principal Dave Stanard as a casualty, but which also allowed Wim Roberson to come in as a very humble and dedicated interim principal to get us through our last weeks at Cubberley. [Tobias wanted the principals' names, which brought all this to mind]. This Thanksgiving edition, I remember quite well. As photographers, we were "supposed" to come up with *something* special and big for the cover of the Catamount, but none of us "upcoming" photographers came up with anything that pleased the Catamount Editors, hence they reprinted a great Scott LeGear photo of a turkey on the front cover with the headline "Cubberley's Grand Old Gobbler". I remember us getting chewed out for not coming up with anything new. Actually, I'm kind of glad we didn't - because Scott was (and is) a very talented photographer, and now I've still got a copy of the turkey picture. Bob Warford's column (Bob's also emailed me - hi Bob!) 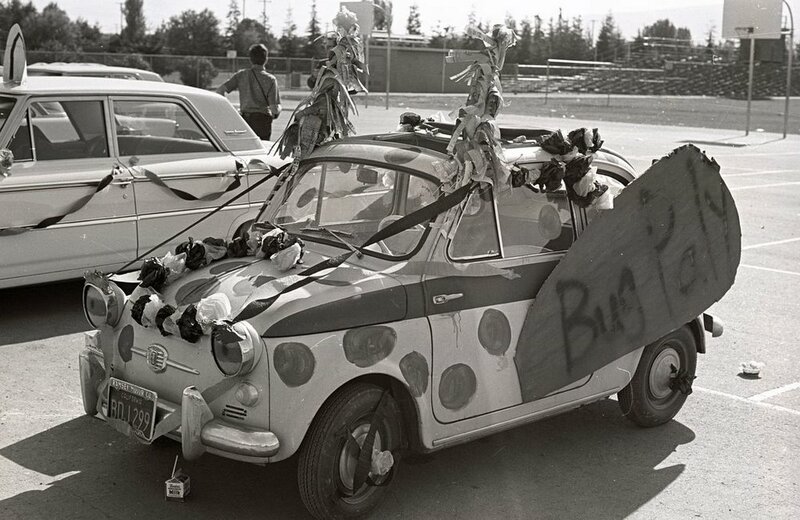 mentions something that reminded me of a photo in my files - Bob wrote in this column "Bug the bug... As you've probably heard, a small wreck of a car with the minimum of work put into it won the "Decorated Car" bit for the Paly Game. Cub never ceases to amaze me. How eleven responsible people could pick this car over all the others because it had a sign that read "Bug Paly" is appalling. A lot of hard work went into a lot of cars and it was all wasted because somebody was "Cute". (Besides I lost)". So now I'll have to go try to find that photo of the bug with the "Bug Paly" sign on it. The December 8 edition announces the "Fritz Rabyne Memorial Christmas Dance" (that's the one where Stevie Nicks performed as part of that band in pre Fleetwood Mac days - I've gone back and listened to some old Fleetwood Mac stuff - those people were/are very talented! Also seen some of Stevie on Soundstage. Great stuff! The December 8 edition also describes Ron Jones doing more experiments where he says he's a "regional head of the Student's Democratic Society," [I think there's supposed to be a "for" in there]... and also in the National Guard, which he said had been "infiltrated" by people including himself, in order to have a huge Christmas Day demonstration in Washington. Jones was quoted as saying "In 1964, some people got together and formed the SDS. We got short hair cuts, joined the National Guard, and got jobs as teachers. At Cubberley, there are three other 'undercover' teachers besides myself." I remember our Journalism teacher at the time telling us she wasn't sure if Jones was serious or not, but that we should keep an eye on things in case there was s story or a photo to be taken. There's a rather odd photo of Jones, arms folded, pulled back from his desk looking (I think) perplexed and perhaps defiant. Now I've got to go find that car picture... Aha! found it! . Hmm... did that evolve into a PT cruiser?